Rosina Wachtmeister has such a playful view to her art that the kids love to imitate it. We had a Power Point presentation of her paintings so the kids got a real feel for her style. Then with the help of pencil and eraser, crayons and calendar picture backgrounds, they made art that closely resembled hers. 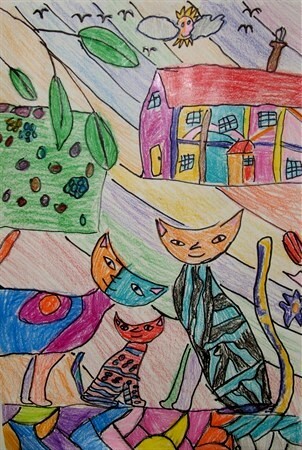 Complete instructions under “Cats” in the 4th Grade Projects Gallery in the sidebar. This entry was posted in Categories and tagged 4th grade, art and crafts for kids, art like, calendar art project, calendar pictures, cats, cats like rosina wachtmeisters, kids, rosina wachtmeister. Bookmark the permalink.